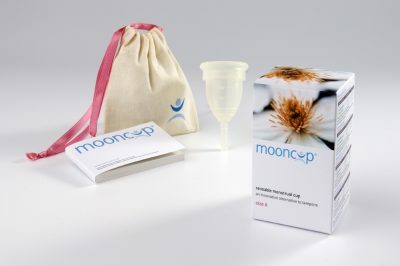 Mooncup® is the original, soft, medical-grade silicone menstrual cup designed by women as the convenient, safe and eco-friendly alternative to tampons and pads. It is the best known brand in the UK and has been sold since 2002. Your Mooncup is always there, ready. No last minute dash to the shops, no stockpiling different absorbency pads or tampons. The Mooncup frees you from having to throw away used products or carry bulky spares (whether smuggled up your sleeve as you head to the toilet or taking up backpack space on your travels). Once you’ve bought your Mooncup, we’re here for you if you need support. We offer a unique telephone and email Advice Service on advice2@mooncup.co.uk run by medical health professionals. You can be assured that the Mooncup® is manufactured in the UK to the highest quality standards – Mooncup Ltd is ISO 13485 certified and is registered with the FDA. Size A measures 46mm in diameter and 50mm in length. Size B measures 43 mm in diameter and 50mm in length. Both sizes have a stem 21mm long, which you can trim to the length that is right for you. The size A Mooncup can hold 29.3 millilitres, and the size B Mooncup can hold 28.8 millilitres to the rim. However, you will still need to empty your Mooncup® every 4 to 8 hours, depending on your menstrual flow, and always after a night’s sleep. *Tampons can hold anything from 6 to 18 millilitres depending on the absorbency you choose (Regular to Super Plus Extra). Your Mooncup’s storage bag has been made from unbleached organic cotton by a Fairtrade Foundation accredited business. 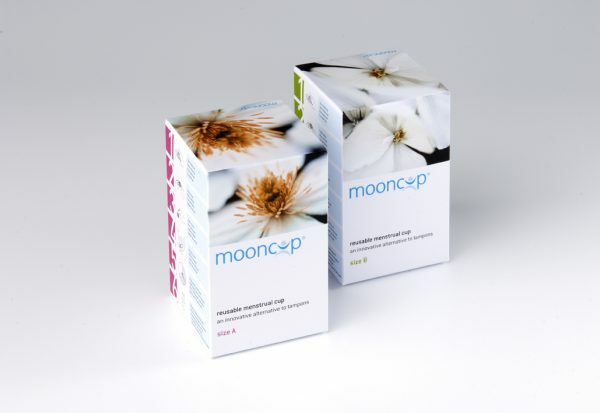 All Mooncup packaging and promotional materials are produced by the UK’s leading environmental printer who work to the internationally recognised ISO quality and environmental management standards.